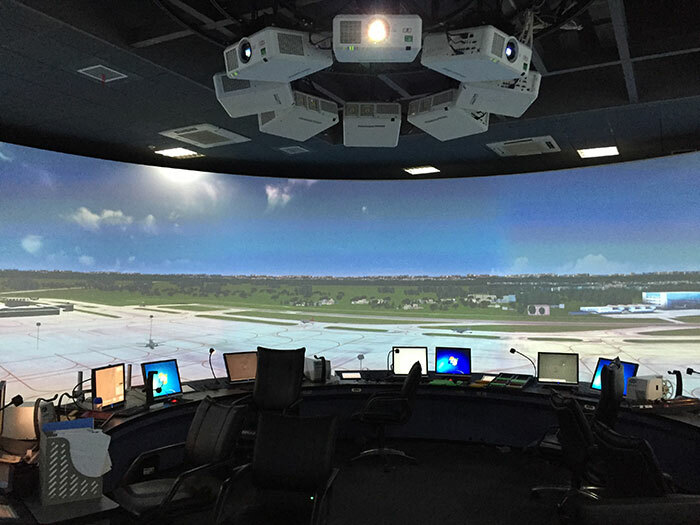 Digital Projection’s E-Vision series of high-brightness, single-chip projectors have been specified to urgently replace and upgrade projectors recently installed into two major air traffic control simulation centers of The Air Traffic Management Bureau of Civil Aviation Administration of China (CAAC/ATMB). As an organization, the CAAC/ATMB is responsible for national air traffic services, civil aviation communications, navigation, surveillance, aviation meteorology and flight information. 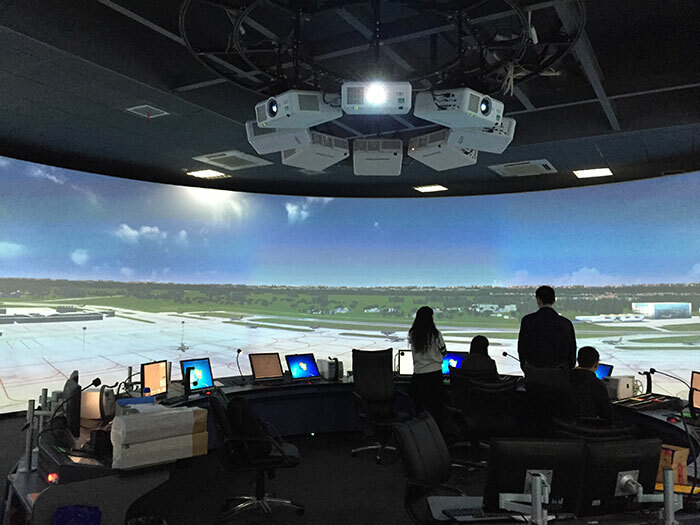 The simulation centres of two CAAC/ATMB regional divisions received the upgrade to replace projectors from another supplier. The original projectors had simply been unable to meet the vital color contrast requirements of dark-field for night time simulation training. 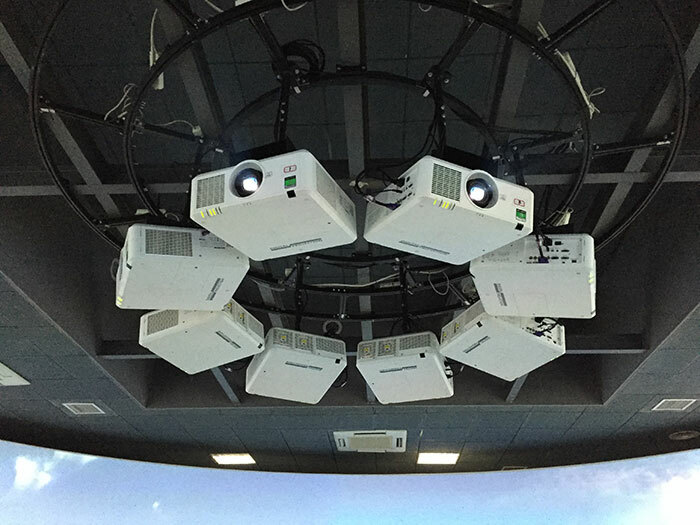 Eight Digital Projection E-Vision 7500 WUXGA 3D projectors replaced the original projectors in the first center, where the integrated simulation system creates a 360-degree seamless projection environment on a screen measuring four meters high and twelve metres in diameter. 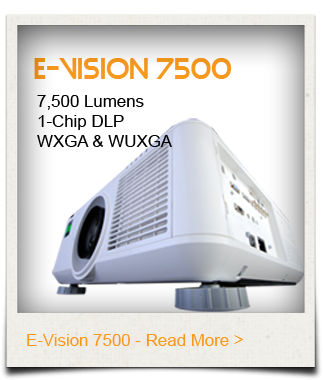 In the other division, a smaller screen dimension called for a replacement specification of eight Digital Projection E-Vision 6800 WUXGA 3D projectors. Initial attempts had been made to correct the color contrast problem. Filters were installed in front of the projection lenses to improve the lack of contrast in a bid to meet the training requirements for dark-field. This, however, triggered further consequences in terms of brightness attenuation. 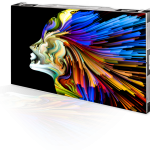 With the projectors unable to meet the needs of the simulation center, there was no other alternative but to replace them with projectors capable of meeting these strict requirements. 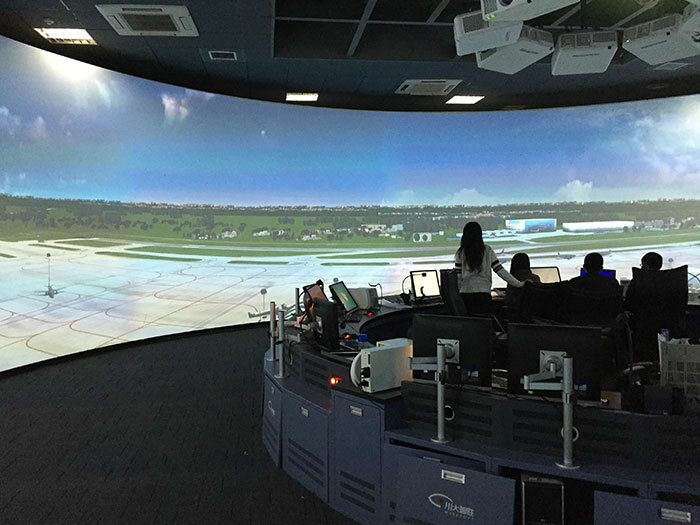 Unwilling to take further chances with its training, the CAAC/ATMB embarked on rigorous screening and comparison of the projectors available on the market and eventually selected the Digital Projection E-Vision 3D series. Unsurprisingly, the deciding factor came down to the excellent color and contrast of the E-Vision series which met the necessary training requirements without the need to add a filter. 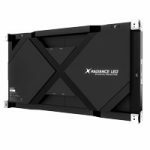 Boasting a 1920*1200 resolution, the E-Vision WUXGA models provide sufficiently enhanced projection quality to meet the user's screen clarity requirements. 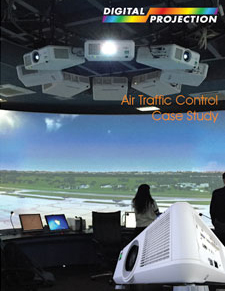 Additionally, featuring 7,500 ANSI lumens of brightness (6,800 from the Digital Projection E-Vision 6800 WUXGA 3D), the Digital Projection E-Vision 7500WUXGA 3D is powerful enough to satisfy the differing lighting environments that are so important within the air traffic simulation chamber.